Our mission is to raise awareness about local marine biodiversity and promote respect for the ocean environment. We greet visitors from all over the world treating them to a very personal view of the fish and invertebrates from our local waters in Clayoquot and Barkley Sounds. RADIATION SAMPLING: The Ucluelet Aquarium is participating in a research study with InForm and the University of Victoria to determine How Radioactive is Our Ocean. This project is a direct result of concerns about oceanic radioactivity caused by the leaking of the Fukushima Dai-ichi nuclear plant. The Aquarium will be sampling local waters once a month in order to continue monitoring radiation levels and contributing to this important study. Results and interpretation are provided online through the Fukushima InForm website. SEA STAR WASTING SYNDROME: In light of the recent sea star wasting epidemic, the Ucluelet Aquarium has paired with the Strawberry Isle Marine Research Society and UCSC to conduct monthly sea star surveys. The surveys will help researches assess the progression and extent of the disease. For more information strawberryisle.org. PARK TALKS: Once a week a Ucluelet Aquarium interpreter brings a small display of local marine animals to the Kwisitis Visitor Centre (on Wickinninish Beach) and educates the public on the featured organisms. Free and available during our peak season (June-August). BIG BEACH TALKS: Explore the tide pools of Big Beach with a Ucluelet Aquarium educator! Free and available during our peak season (June-August). MARINE DEBRIS: The Ucluelet Aquarium is proud to be part of a number of projects and initiatives aimed to educate the public and reduce the impacts of marine debris. Our Be a Better Beach Goer project (generously sponsored by MEC and The Clayoquot Biosphere Trust) has educated thousands of visitors on how to enjoy our majestic coastline responsibly. We are currently hosting an interactive marine debris art installation designed by Pete Clarkson and Dan Law. MONTHLY MICROPLASTIC SURVEY: The Ucluelet Aquarium is conducting a microplastics study with the goal to better understand the distribution of microplastics on local beaches between Ucluelet and Tofino, BC. By working with a network of citizen scientists, we hope the information from our study will engage our local community and visitors to limit single-use plastic items and find plastic alternatives. This study also aims to focus on awareness and education about microplastics and marine debris on our precious coast. See our most quarterly report for more details. The Ucluelet Aquarium Society is grateful to the following sponsors for their support and encouragement which made the 2012 opening of our current facility possible. To give a donation please contact patrick@uclueletaquarium.org or visit our Canada Helps page. Koji Sato, Intellect Solutions Inc. In the spring of 2004, the Ucluelet Mini Aquarium was opened as a pilot project on the Ucluelet waterfront. Conceived by Philip Bruecker as an alternative to large modern public aquaria, its focus was on local species only, interactivity, open display of infrastructure and, most importantly, a “catch-and-release” model which saw specimens released back to their home habitats each autumn. This pilot project proved popular and the non-profit Ucluelet Aquarium Society was formed to oversee and grow the aquarium. By the late 2000’s, the increasing popularity of the aquarium strongly suggested that our ‘plywood shack’ Mini Aquarium was no longer able to meet the needs of the public and plans were hatched to construct a permanent facility. 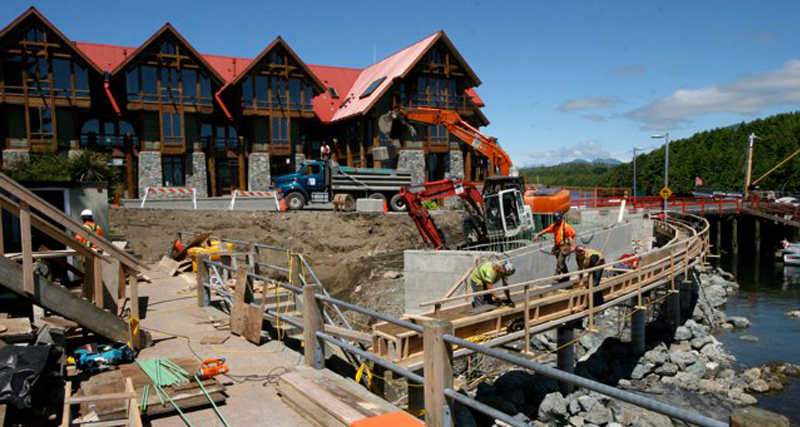 With thousands of hours of volunteer input, widespread contributions from local businesses and, finally, support from municipal, provincial and federal governments, the new Ucluelet Aquarium opened its doors in May of 2012. Designed by Blue Sky Architecture and built by local tradespeople, the aquarium has proved popular with residents and visitors alike. The aquarium now attracts international attention. As visitorship continues to grow, and programming, outreach and conservation efforts expand and evolve, the Ucluelet Aquarium has remained true to its founding principles.